v. : ; 29 x 43 cm. Compares the monthly (later quarterly) statistics of the current year with that of the preceding year. 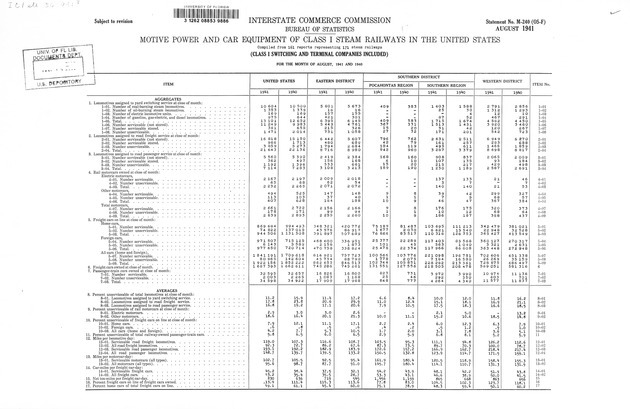 "Compiled from ... reports representing ... railroads (class I switching and terminal companies included)." ITEM POCAHONTAS REGION SOUTHERN REGION ITEM No. 1-03. Number of electric locomotive units .... . ..
1-04. Number of gasoline, gas-electric, and diesel locomotives. 1-06. Number serviceable (not stored). . . . .
1-07. Number serviceable stored. . . . . .
1-08. Number unserviceable. . . . . . .
2-01. Number serviceable (not stored). . . . .
2-02. Number serviceable stored. . . . . .
2-03. Number unserviceable. . . . . . .
2-04. Total. . . . . . . . . .
3-01. Number serviceable (not stored). . . . .
3-02. Number serviceable stored. . . . . .
3-03. Number unserviceable. . . . . . .
3-04. Total. . . . . . . . . .
4-01. Number serviceable. . . . . . .
4-02. Number unserviceable. . . . . .
4-03. Total. . . . . . . . .
4-04. Number serviceable. . . . . . .
4-05. Number unserviceable. . . . . .
4-06. Total. . . . . . . . .
4-07. Number serviceable. . . . . . .
4-08. Number unserviceable. . . . . .
4-09. Total. . . . . . . . .
5-01. Number serviceable. . . . . . .
5-02. Number unserviceable. . . . . .
5-03. Total. . . . . . . . .
5-04. Number serviceable. . . . . . .
5-05. Number unserviceable. . . . . .
5-06. Total. . . . . . . . .
5-07. Number serviceable. . . . . . .
5-08. Number unserviceable. . . . . .
5-09. Total. . . . . . . . .
6. Freight cars owned at close of month. . . . . . .
7-01. Number serviceable. . . . . . .
7-02. Number unserviceable. . . . . . .
7-03. Total. . . . . . . . . .
8-01. Locomotives assigned to yard switching service ..
8-02. Locomotives assigned to road freight service. . .
8-03. Locomotives assigned to road passenger service ..
9-01. Electric motorcars. . . . . . . .
9-02. Other motorcars. . . . . . . .
10-01. Home cars. . . . . . . . .
10-02. Foreign cars. . . . . . . . .
10-03. All cars (home and foreign). . . . . .
11. Percent unserviceable of total railway-owned passenger-train cars. 12-01. Serviceable road freight locomotives. . . .
12-02. All road freight locomotives. . . . . .
12-03. Serviceable road passenger locomotives. . . .
12-04. All road passenger locomotives. . . . .
13-01. Serviceable motorcars (all types). . . . .
13-02. All motorcars (all types). . . . . . .
14-01. Serviceable freight cars. . . . . . .
14-02. All freight cars. . . . . . . .
15. Net ton-miles per freight car-day. . . . . . .
16. Percent freight cars on line of freight cars owned. . . .
17. Percent home cars of total freight cars on line. . ........ .
averages are computed for each railway separately and then totaled.